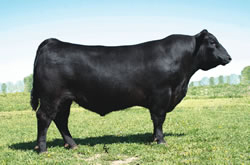 Ravan Angus is owned by Douglas and Randal Bennett. Doug lives in Oregon and runs Oregon Cattle Ranch. Ravan Angus is located in the beautiful East Texas just 5 miles from Lake Fork. We brought these cattle to Texas from Oregon because we needed an elite group of cows. Most of these cow were from the Traveler Pedigrees. The cow herd is based on performance genetics. We focus on growth, milk and moderate birth weight. The cattle have to perform on east texas pasture. The cattle have to be sound reproductively and functionally. EPD's must be balanced relying on multitrait selection.